The COMMON THREADS: POST-INFECTIOUS AUTOIMMUNE DISEASES OF THE BRAIN Conference, a two day event founded and organized by The PANDAS Network, is an international, multidisciplinary conference that breaks down the silos in medicine by bringing together clinical and research experts in the areas of neurology, immunology, psychology, psychiatry, infectious disease and more to explore the commonalities among post-infectious autoimmune disease models and best practices for treatment. The event will also highlight the newly integrated clinical and research site for PANS/PANDAS patients at Columbia University Medical Center (CUMC) serving pediatric patents in the greater New York area. 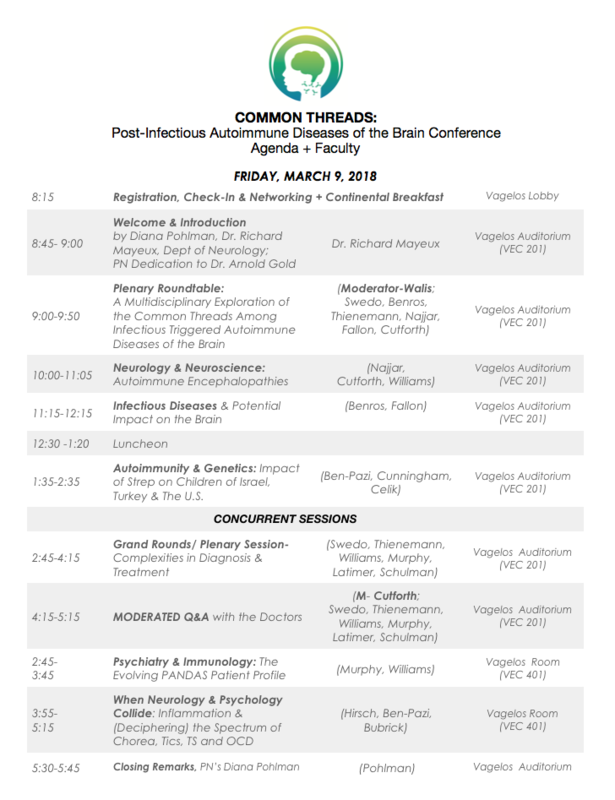 The Professional Day for Clinicians, Researchers & Other Medical Professionals on Friday, March 9th explores commonalities, new research, diagnosis, treatment and best practices for Autoimmune & Infectious Triggered Neuropsychiatric & Related Disorders including basal ganglia encephalitis, PANDAS/PANS, OCD, Tourette, Sydenham Chorea and more. This event is ideally suited for researchers, physicians, psychologists, psychiatrists, nurses, residents, fellows and other healthcare and mental health professionals including pediatric neurology, pediatric psychiatry, pediatric otolaryngology, family practice, urgent care, internal medicine and pediatrics, integrative specialists, pediatric dentistry and more. The COMMON THREADS Conference features top experts in their fields from across research institutions worldwide, as they collaborate and share data and treatment experiences. Columbia University Alzheimers expert Dr. Richard Mayeaux will welcome a worldwide audience as we begin with a moderated Plenary Roundtable including NIMH’s Dr. Susan Swedo, autoimmune encephalitis expert Dr. Souhel Najjar, Columbia neuroscientist Dritan Agalliu, Ph. D., and others. 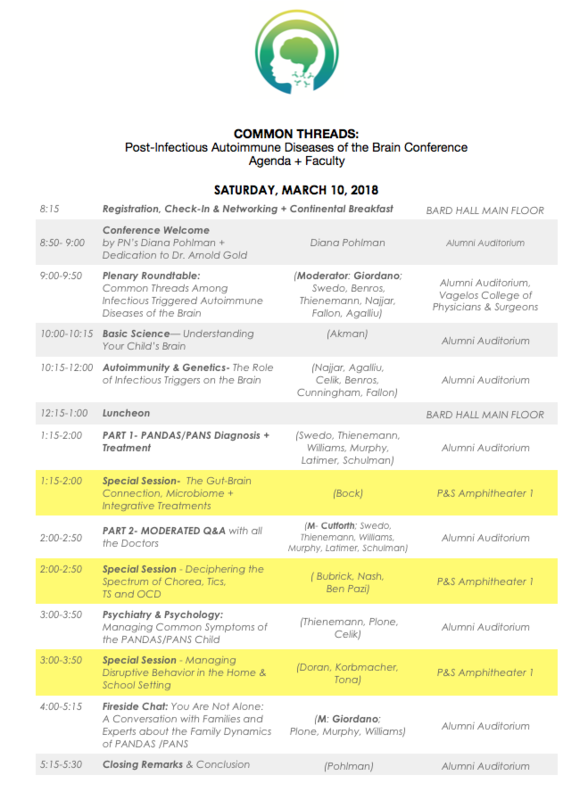 Presentations from various disciplines, including neurology, neuroscience, immunology, autoimmunity, genetics, infectious disease and psychology will provide attendees with a rare opportunity to understand how the common threads across seemingly disparate disciplines of medicine align to create both biologically based and neuropsychological issues common in a subset of the pediatric population. A translational science based Grand Rounds session focused on treatment protocols for PANDAS-PANS will support practitioners and clinicians in the field. Attendees are encouraged to register for CME credits, offered free for the day long event. Download the Friday, March 9 AGENDA here. On Saturday, March 10th, PANDAS Network and our alliance partners welcome Parents & Caregivers, School Specialists and Professionals of all disciplines at CUMC’s Alumni Auditorium as we explore basic brain science, new research, diagnosis, treatment and the commonalities among Autoimmune & Infectious Triggered Neuropsychiatric & Related Disorders including basal ganglia encephalitis, PANDAS/PANS, OCD, Tourette, Sydenham Chorea and more. All Parents, Educators and Professionals will hear from experts in the morning Plenary Roundtable discussion, followed by sessions on neuroscience, neurology, autoimmunity and genetics. PANDAS Network will make a special announcement during the afternoon luncheon at nearby Bard Hall. And an afternoon dual track will provide 6 additional topics from which to choose allowing attendees to navigate to the most relevant content depending on their stop on the PANDAS/PANS journey. We encourage families and school personnel to share the Common Threads event flier with your pediatricians, school nurses and other medical and psychological support team. Download the Saturday, March 10 AGENDA here. Council for Continuing Medical Education to provide continuing medical education for physicians. Columbia University School of Nursing is accredited as a provider of continuing nursing education by the American Nurses Credentialing Center’s Commission on Accreditation. 8 credit hours for March 9, and 9 for March 10. RNs should claim only the credit commensurate with the extent of their participation in the activity. Senior Associate Dean, Academic Affairs and Dean of Students, Columbia University College of Nursing. For Medical Professionals seeking CME and CNE credit, please check in at the CME/CNE Education Station at Registration on Friday and Saturday. A downloadable CONFERENCE PROGRAM is here. Common Threads Conference convener PANDAS Network would like to dedicate this conference to Columbia’s own pediatric neurologist Dr. Arnold Gold. We’d like to sincerely thank Sandra Gold, PN Director of External Relations, for her dedication and support in helping make our first annual Common Threads Conference at Columbia University Medical Center a reality. Cigden I. Akman, MD, Chief, Division of Child Neurology and Director, Pediatric Epilepsy Program, Associate Professor of Clinical Neurology and Pediatrics of the Division of Pediatric Neurology, Departments of Neurology and Pediatrics, College of Physicians and Surgeons of Columbia University. Jerry Bubrick, PhD, is the senior director of the Anxiety Disorders Center and director of the Obsessive-Compulsive Disorder Service at the Child Mind Institute. Wendy Nash Moyal, MD, is a child and adolescent psychiatrist at the Child Mind Institute. She has extensive experience evaluating and treating a wide variety of patients from infancy to adulthood. PLEASE NOTE: VENUE LOCATIONS FOR DAY 1 & DAY 2 ARE NOT THE SAME. For detailed Directions & Hotel Recommendations, please see the Directions + Hotels tab on the Conference website. Our featured hotel is Aloft, with a limited block of rooms offering $209 a night and located within walking distance of the CUMC campus venues. DOCTORS: PLEASE CLICK HERE TO REGISTER FOR DAY 1 MARCH 9, 2018 -- A DAY DEDICATED TO THE MEDICAL COMMUNITY AND PLANNED SPECIFICALLY FOR THE NEEDS OF CLINICIANS, RESEARCHERS, RNS AND OTHERS IN RELATED FIELDS. A MEDICAL LICENSE OR PROOF OF AFFILIATION IS REQUIRED TO REGISTER. WE ARE PLEASED TO OFFER FREE CME CREDITS FOR ALL ATTENDEES AT THE EVENT ON MARCH 9.